More after the fold. I'll admit, the gimmick factor of the touch screen played a part but a the fact that the touchscreen is on a 3.5" 920,000 pixel screen was also a nice selling point. I was a little concerned about the fact that I'd be 1) going away from Canon and 2) introducing a new storage medium (MemoryStick Duo) to the mix. Fortunately, the DSC-T700 features a whopping 4 gigabyte internal memory storage capacity, so I do not even need to invest in another format at this time! I've had the camera for 2 weeks and here are some of my initial impressions. The camera is barely larger than the size of the LCD screen on the back and only has 3 buttons (power, play and shutter) and a zoom control. However, as minimalistic as this seems, you have to remember that all of the functionality is handled on the touchscreen LCD. The button placement is a little awkward, the shutter button is small, but not overly-sensitive. The zoom control is a little awkward, especially if you are attempting to shoot one handed. I have found that I sometimes block the lens opening with my left hand when holding it. You have to conscienciously hold your fingers out of the way when shooting, especially with flash. The sliding cover is nice and makes it very easy to protect the lens opening as well as power it on, even with a simple flick of the finger. The touchscreen interface is fairly intuitive and readily usable. Even when doing delicate pointing operations it has been easy and accurate to use. However, after any sort of use it tends to become bleared with the oil from your fingers. The flash unit is placed very close to the lens which means any photos of humans will require the red-eye reducing pre-flash. With out the pre-flash, anyone looking toward the camera will have severe, brightly glowing eyes. This makes this camera barely usable at indoor sporting events. When taking photos of my son's basketball games, where pre-flash was not an option, everyone had bright glowing pupils that the built-in red-eye reducing post-processor could not deal with. In fact, some of the red-eye effects were downright creepy. Check out this crop of one of Cohen's teammates. His eyes almost look as if they have afterburners. This was taken about 6 feet away. This is my first device with image stablization so its a new experience for me, however from my initial impression, it works fairly well. Focusing has not been an issue with the camera at all. One of the touted features of the camera is Face Detection, which is a setting that allows the camera to focus automatically on a automatically detected face in the frame. You can also assist the focusing by touching on the screen where a face is. In fact you can arbitrarily drag the focus box around on the screen as you wish, which makes setting the focusing very easy, though if the subject (or your camera-hand) is moving, it may not really matter where you point the focusing frame. But if you do have a steady subject, it does prove useful. I have been very impressed with the metering. The camera offers spot, center-weighted and full-frame metering. All seem to work well. I've not had to manually tweak the EV settings at all to compensate for any type of scenes except for indoor sports (I went as manual as I could for that, more later). I have had the opporunity to shoot snow, sunsets and the usual indoor shots so far with good results. A feature that needs more experimentation on my part is the Dynamic Range Optimization (DRO) feature, which applies what appear to apply curves to shadows and midtones to provide a little more separation. This is an optional feature with two settings (standard and aggressive). I tend to shoot fully auto or as manual as possible with my cameras, so I haven't delved very deep into the available scene shooting modes, which include Beach, Snow, Fireworks, Underwater, Action and, oddly enough, Food. I have experimented with the Action mode ("Capture fast moving subject") and am not impressed with the results. It was severely under exposed indoors. But given the choices of scene shooting, they seem pretty limited to those in snowy regions, tropical regions, or foodies. However, there are other provided shooting modes that aren't lumped together with these: Landscapes, soft background, low light portrait and low light scene. The program mode allows you to customize a lot of the functions of the camera, such as ISO (80 - 3200) , metering, EV compensation, focus distance, and enable or disable the DRO, bracketing, face recognition and steady shot. However it does not give you control of either aperture or shutter speed to go fully manual. I was able to use these settings to "improve" the indoor sports capability over the 'fast moving subject" scene mode. By disabling pre-flash, setting the ISO 800 (ugh) and manually setting the focus distance to 3 meters, I was able to get a few good shots, especially of closer subjects. Its just a camera made for indoor sports. However, out of doors, it shoots just fine. The camera has exceptional macro capability. In fact, this is one of the features that interested me in this camera in the first place. I got to handle a T77 about 6 months before this purchase and I got to see its macro capability first-hand and was really impressed. I don't know how Sony manages to cram steady shot, macro and 4X zoom into such a tiny optical assembly, but they did. The smile-related features of this camera are abundant. The most-used feature will probably be the facial recognition for focusing. Another feature is the ability to "detect" smiles. When you're pointing the camera at a subject's face, the camera will superimpose a box around their face, and display a scale for how much of a smile it detects allowing you to set a threshold for the shutter release. Ok, so that's interesting, if not a little goofy. But here's where it gets a bit strange. Among some of its built in post-processing features, among things like writing freehand on the picture, adding color or other enhancements, is the most strange feature of all: modifying people's smiles. Yes, this camera will actually add smiles to people's faces who are not smiling or partially smiling. The results, as I have found, are very strange. However, it does yield a few minutes of some side-splitting laughter, especially when you compound the effect. But the concept, in my opinion, is just a bit too bizarre for me. If you're looking for an acceptable point and shoot for indoor flash photography or outdoor scenes, this camera is just fine. If you're not into pixel-peeping the shadows and dark areas you will be just fine with the quality. However, this is no DSLR. In fact its no prosumer camera, and you should not expect the quality of one. But it is a camera that slips effortlessly into a pocket and is there when you need it. 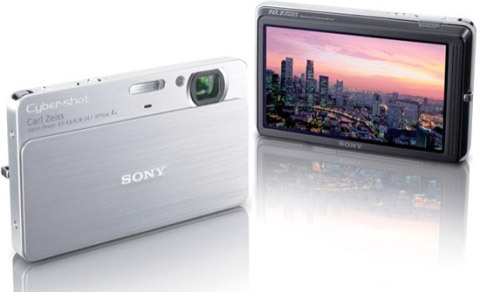 Going in to this purchase I did not have much faith in the current crop of 10 megapixel P&S cameras. Its just too many light wells packed into a small area. In fact, dimensionally, it has 2.5 times as many pixels crammed into 65% less space. Now, I keep talking about the Canon G2. Its not the best camera in the world, but it is a benchmark for which I am familiar. And I am not promoting older, smaller megapixel cameras. 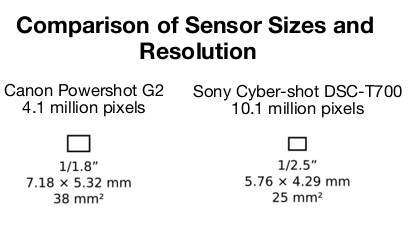 I am just stating that smaller is not necessarily better when talking about CMOS sensors and pixel density. Despite the sheer advancements in technology (10.1 million pixels in 25 square millimeters?!) and no doubt the price, the cost is evident in the resulting image quality. While consumers are trained to believe that more megapixels is better, they're really getting less quality. However, one has to remember this is not a DSLR, in fact its not even a "prosumer" grade camera, it is a point and shoot. But I just find it amazing that they're getting the same amount of megapixels out of 25 square millimeters that a Canon 40D DSLR is getting out of 328 square millimeters! That's 35 million pixels per square centimeter compared to just 3.1 with the 40D. Unfair comparison, I know, but I just wanted to point that out.